Yesterday, Spain issued debt at the highest yield in the last 14 years. One of the words most listened in the news lately is “spread”. I recalled some words from my brother, months ago, pointing that absolute value of yields hadn’t changed that much as even though the spread was increasing German bonds’ yields were declining. I wondered, how much are they declining? Germany’s GDP is around 3,600 bn€. Its state debt is reportedly about 83.2% of its GDP, around 3,000bn€. I checked German bond numbers in the German Finance Agency [PDF]. In the latest factsheet from end September, you may see the different auctions of different bonds and bills planned for the year and the volume of each one. You may get as well a glimpse of the debt structure. The factsheet shows how much of its 1,101bn€ in outstanding government securities are auctioned during 2011 in 1-year bills and how much in 10-year bonds (of the 1,101bn€, 275bn€ will be issued during 2011). Using that structure and the respective maturities, the composition for the whole outstanding securities can be estimated. Note: When bonds are auctioned the coupon (interest) to be paid on them is fixed by the state, e.g., the 10-year notes have a coupon or interest paid on its face value of 2.25%. It is the yield what is variable because buyers will pay more or less for the bonds’ face value. 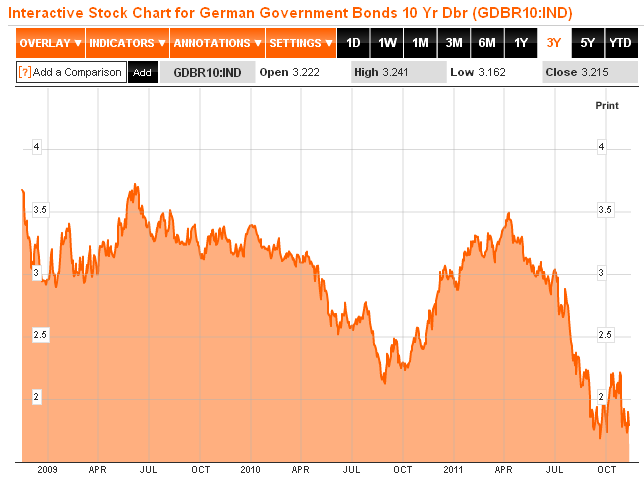 What are then German bond yields and latest prices paid for them? This information can be found at Bloomberg or at the Bundesbank (for a higher detail and historical yields). You may see there that 10-year bonds currently (as of yesterday) had yield of 1.78% and latest price was 104.19 euro cents, paid for a euro of face value (remember that the coupon is 2.25%, as it is stated in the German Finance Agency factsheet). With all the previous inputs the next question is clear: How is the debt crisis affecting Germany? The fact that investors are running away from the debt of other countries (at the same time that they demand lower prices and thus increase yield of Spanish bonds) they see German bonds as a refuge: they are willing to pay more than 100 cents for a face value of one euro, making debt cheaper for Germany. In the graphic below we can see the evolution of the 10-year bond during the last two years. It has had around 3% of average yield during that time (versus current yield of 1.78%). We can get an idea of how much Germany is saving during these troubled times. Let’s calculate those savings. You may see in the table below, that given the estimated structure of the German debt (based on this years’ proportion of auctions by the Finance Agency), the coupons paid for each kind of bond on their face value, the prices and yields, from end June and November, Germany has achieved what would be yearly savings of about 12 bn€. German debt: securities structure, coupons, yields, savings from end June to November (data as of Nov. 15, 2011). These yearly 12bn€ would be saved just by the government securities (1,101bn€ outstanding), not public debt from other German institutions (~3,000bn€ in total), and only if yields continued to stay at current levels during the next issuances of debt. As a final note: the German contribution to the European Financial Stability Facility [PDF] (EFSF) is 211bn€. Wild guess: How much of that contribution could be paid with the German debt savings if its yields stayed this low?